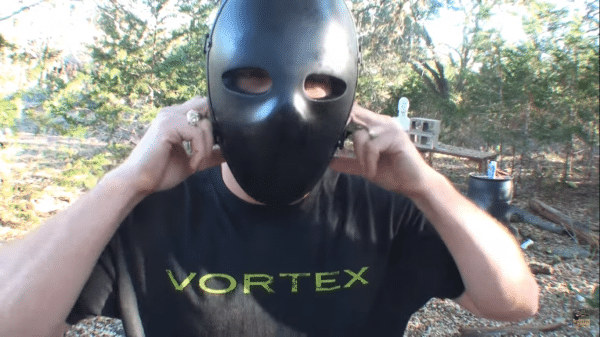 Kevlar Bulletproof Face Mask: Does It Work? Watch This And Find Out! Demolition Ranch is at it again in a “what if you ever got shot in the face” episode. Perhaps the first question might be, who would be willing to test that? The second question might be, bulletproof vests protect the chest area, but what about a shot to the head, which could much more dangerous? Check out this bulletproof mask take on a variety of different bullets. The mask is made of kevlar and is meant to take on a certain range of firearms all the way up to a .357 magnum. These things just might hold up in case you get shot in the face. Although the YouTuber said that it limits your field of view and it is pretty uncomfortable. Basic military operations use the mask and there are definitely some upsides and some downsides to wearing one. This bulletproof mask is a level two, meaning it can stop a 22-long rifle, a 9 mm, a 40 cal, and up to a 357 magnum. The mask is placed on Lieutenant Dan, the mannequin. Classic of Demo Ranch, the shooting will start with the least powerful gun and they will work their way up. First up, a 22 long rifle out of a Ruger. He shoots and plugs Lieutenant Dan in the noggin, but the mask barely takes a dent. On to the next gun. He fires and hits right above the eyebrow. Still, the bullet wasn’t able to penetrate. Had the mask been off, Lieutenant Dan would be a goner. Next, the 9mm. He gets him at the corner of the eye and the mask is damaged, but Lieutenant Dan still lives. Next, the 40 Smith & Wesson. An accidental mishap goes through Detective Dan’s eye so he’s dead. But, let’s give it another shot from the same gun. Still the bullet doesn’t penetrate. Up next, the 44 special. It gets him in the teeth. The 44 magnum is up now with a hollow point. It knocked a little of the paint off, but nothing made it through. The 17HMR is a 22-magnum case neck down to take a 17-caliber bullet. It’s tiny and very fast but didn’t penetrate the mask. It’s clearly time for the big boys. Out comes the Smith & Wesson 500 magnum. Yep, that shot blew the mask right off Lieutenant Dan’s head. May he rest in Peace. That bulletproof mask surely took a lot of hits and for the most part, it endured. Do you think the mask was effective in stopping bullets? Tell us in the comments below!